These hardy, straight-trunked trees have large, sticky, fragrant buds. 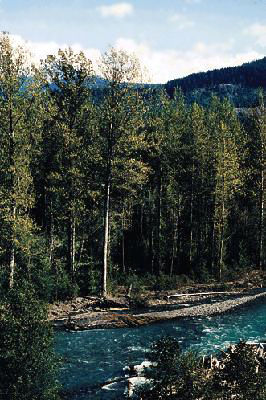 On the coast, black cottonwoods can reach 50 metres tall, but balsam poplars usually reach only 25 metres. Shiny, dark green leaves are 6 to 12 centimetres long, pale underneath and often marked with brown. They vary from oval to wedge-shaped and have a sharply pointed tip. Male and female catkins are on separate trees. Male catkins are small, 2 to 3 centimetres long and female catkins are larger, 8 to 20 centimetres long. 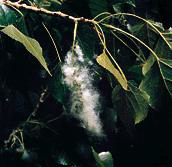 The hairy capsules open to release seeds which are covered with white, fluffy hairs. 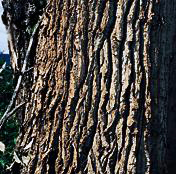 The bark is smooth, yellowish-grey on younger trees, but grows thick and deeply grooved with age. Black cottonwood grows west of the Rocky Mountains and balsam poplar grows in the north, from the upper Stikine to east of the Rockies. Balsam poplar and black cottonwood hybridize where their ranges overlap. Poplars are rare on the Queen Charlotte Islands and northern outer coast of Vancouver Island. Poplars require ample moisture and plenty of nutrients to grow well. They favour floodplains and moist upland sites with lots of light. They do not grow well in the shade of other species. First Nations people on the coast and, more commonly, in the Interior made dugout canoes from black cottonwood. Also, the Okanagan people made cottonwood into sideboards for riding and cradles to flatten their children's heads. Cottonwood burns well and was used to make friction fire sets. Ashes were used to make a cleanser for hair and buckskin clothing. The Thompson people produced soap from the inner bark. The Hudson's Bay Company reportedly continued using their method, combining the inner bark with tallow. 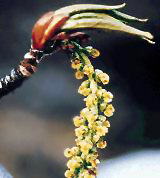 First Nations people used the resin from buds to treat sore throats, coughs, lung pain and rheumatism. An ointment, called balm of Gilead, was made from the winter buds of balsam poplar to relieve congestion. The buds contain a waxy resin with anti-infectant properties still used in many modern natural health ointments. Bees collect it and use it to seal off intruders, such as mice, which might decay and infect the hive. The short, fine fibres are used in tissues and other paper products. It is named cottonwood for the white hairs on mature seed which float through the air like wisps of cotton or snow.